In my family, no one knows how to play shogi. Not that I know of, at least. I do not remember seeing a board and pieces in the house of any relative. Occasionally, I have seen a board in some store in Liberdade, the Asian district of Sao Paulo. However, all of my childhood curiosity about shogi received the same answer: "it is the Japanese chess. It plays like chess, but more difficult." Why is it that the "difficulty" factor was attributed to shogi? I wonder if it is because there is a kanji stamped instead of a piece carved in the shape of a horse or a rook. 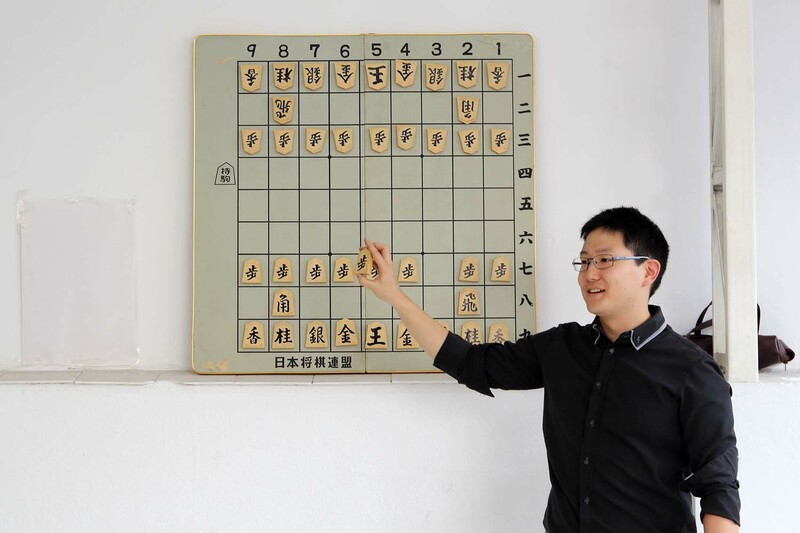 "Learning to play shogi has three main barriers," says Rodrigo Yuji, 25, pharmacist, third generation, and a shogi practitioner since 2012. "The first is interest. There are many different types of people in the world and not very many might be interested in shogi. The second is perseverance. We all have difficulty at some point in learning. However, few are give up. The third is discipline. Learning a little every day is the hard part. By overcoming these three barriers, I believe anyone can learn shogi or anything else, knowing how to read Japanese or not." To learn more about shogi and the difficulty of learning its rules, I attended a workshop organized by the Brazilian Shogi Association. To my surprise, instead of getting started right by presenting the rules of the game, the event began with the history of Japan. 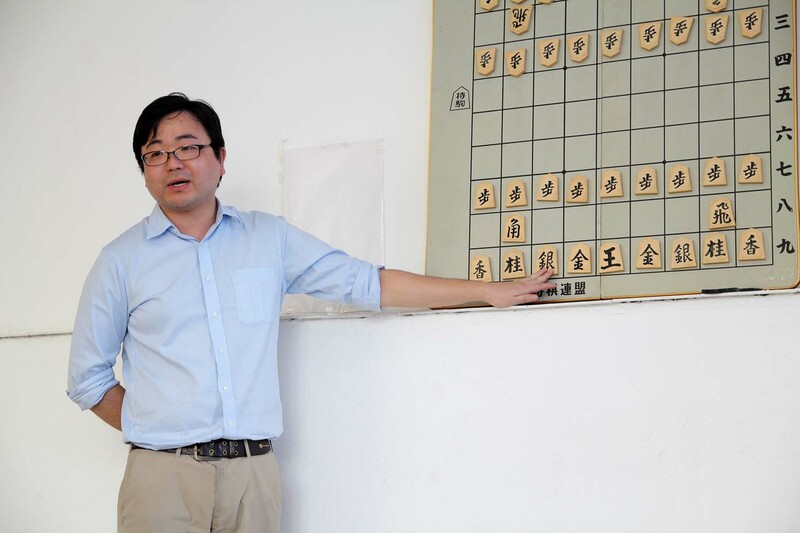 "When explaining the characteristics of shogi, it is imperative to know about the history of Japan," said Tatsuya Ishikawa, a 28-year-old Japanese journalist who has lived in Brazil since 2013, and was one of the workshop instructors. "Shogi came to Japan during the Heian period (8th to 12th centuries), a time when Buddhism became very popular. Buddhism, on principle, forbids killing. There is currently the death penalty in Japan, but between the years 850 and 1156 (according to the Western count), still during the Heian period, the death penalty was abolished. Buddhism is considered to have influenced this change," explains Ishikawa. This fact may explain one of the characteristic rules of shogi, which is the reuse of a captured piece. "This religious environment influenced shogi. This rule would have suggested the idea of 'not killing the pieces', which would lead to the rule of 'use the pieces in the best possible way so that they can be used again,”' Ishikawa adds. "For some, it could make us imagine a historical situation on the board. For others, it illustrates the whole process that Japanese people have come up with and how they developed this game. My personal view is that history serves to show our evolution and avoid our past mistakes" says Rodrigo. There are some myths related to shogi that have become folklore amongst fans. Ishikawa told one of them: "Sometime after World War II, the occupational government took some measures to eliminate 'military ideas' from Japan. As part of these actions, the occupational government banned 'wild games,' including shogi. The reasons were different from chess, there is no queen piece, so there is gender discrimination; making captured pieces fight against their former allies is a violation of the Geneva Convention which prohibits the abuse of prisoners of war. 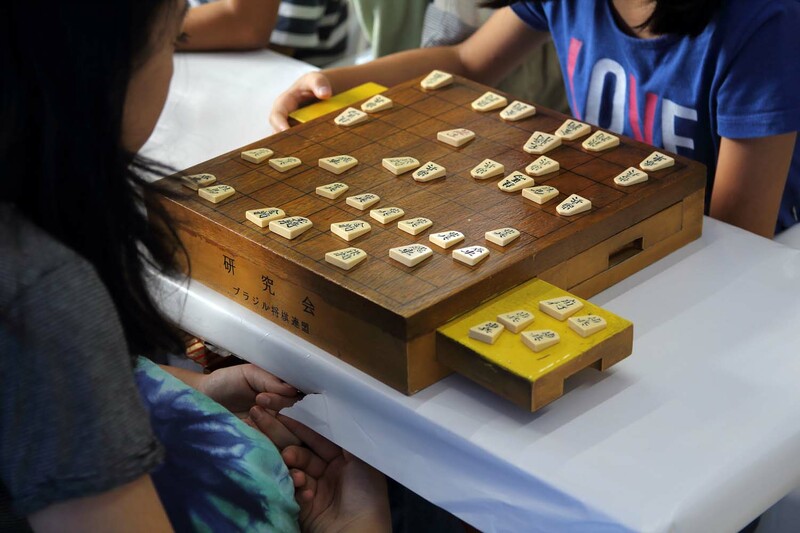 Upon hearing this, shogi master Kozo Masuda explained to the military command that it is an ancient virtue of our country to protect women from danger and that re-use of captured pieces is not abuse, but forgiveness of enemies based on the idea of equal treatment. Shogi was then excluded from the list of prohibited items." Screenwriter William Jun Sugiyama, 29, Sansei, went to the event willing to have a deeper understanding shogi and to learn the basic rules. "I knew a little bit of shogi from manga and other things related to Japanese culture, but I had never played it" he says. Jun plays karuta, a type of Japanese card game as well as chess. But he does not know anyone who practices shogi. His impression at the end of the workshop, "I think it was a very good explanation for those who do not know much about it. I already knew some things from hearing similar explanations about the game go or in manga about shogi. Many of the rules are similar to chess, while the different ones are complicated, but I think it's a matter of adaptation." At the workshop, the instructors also highlighted the importance of courtesy in the game, with greetings before and after each match. "The competition etiquette is essential, so it's good to teach it early, especially to the younger ones who were in class. Establishing posture is the first step in teaching something new because it will be difficult to teach those who have already gotten used to the 'wrong' actions," notes Jun. It is interesting to note the difference between how Ishikawa and Rodrigo became aware of shogi, since one is Japanese and the other, Brazilian. "In elementary school, at the age of 10, I learned about shogi. I got a board, pieces, and an instruction book for beginners from my parents and started learning. However, I did not know anyone who played shogi, so I stopped. At college I read a manga called Hachiwan Diver [N.E. 81diver by Yokusaru Shibata], I remembered how shogi was interesting, and then I went back on playing. Then I studied a strategy book for intermediate players and played online games to deepen my knowledge. After graduating from college, I came to Brazil. Now I am learning from the veterans of the Shogi Association" says Ishikawa. Rodrigo already knew shogi through the practice of chess. "I started playing chess in 2011. When I was looking for chess supplies, I met a gentleman who only worked with board games and who introduced me to shogi. I found it interesting and looked for content on the internet. At the time, there was very little content available, but there was a YouTube channelHidetchiwhere I learned a lot," he says. The benefit most commonly attributed to the practice of traditional board games is to stimulate logical reasoning, but there are others. "I would like to highlight as the main benefit the fact that, in order to win, we must learn from the past," says Ishikawa. "The current shogi format was established in the 16th century. If a 16th-century master and a contemporary master played a match, surely the contemporary would win. That's because the shogi's tactics are always evolving. No matter how talented a person may be, there is a limit to the invention of tactics. One has to learn from the predecessor's legacy to become a stronger player." "Shogi has benefits for all ages," adds Rodrigo. "I believe that the main points for children would be developing logical reasoning, memory, devising tactics, managing resources and learning from defeat. For the elderly: management of resources and development of new connections between neurons, strengthening their branching and avoiding degenerative diseases." Ishikawa studied Sociology in college. In particular, he studied the low birth rates and the aging population in Japan. "The reason I came to Brazil is that I think people with international experience are important for Japan's future, where low birth rates and aging of the population are advancing. [In addition] Practically all shogi competitors are Japanese, so as the low birth rate and the aging population advance, shogi culture will also decline," he says. 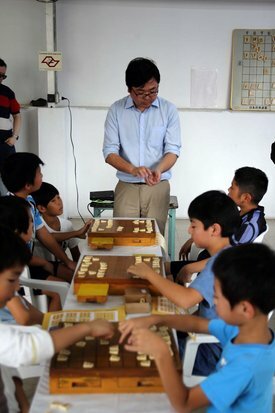 "When coming to Brazil, I learned that the Shogi Association was spreading the shogi culture here. Then I remembered Hachiwan Diver. One of the themes of this manga is the dissemination of shogi on global scale. I really like this manga and the work of its author, Yokusaru Shibata, so I would like to help spread shogi around the world," Ishikawa went on to say. "The Brazilian Shogi Association, according to Hiroshi Utsumi it’s former president, was founded by Japanese people in 1948. I have been a member since 2012. For the past three years, I have helped supporting shogi and at events," says Rodrigo. Currently, according to Rodrigo, the association has approximately fourty active members. "This number is shrinking and we are struggling to reverse this situation," he says. The number of players in Brazil could reach about a thousand. As a reference, the association’s Facebook page has 781 followers. What are difficulties for making shogi popular? "Shogi is a type of regional chess, whose players have an affinity with Japanese culture. Unlike the game go, which is a common game in several countries in the East. 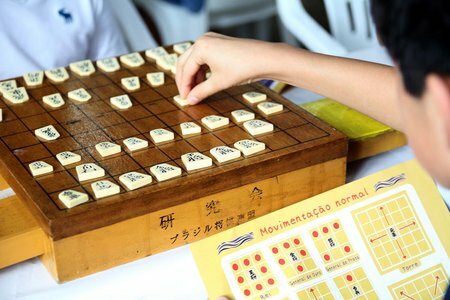 In addition, shogi is mistakenly associated with older people of older age. Another reason why shogi isn’t catching on is that is contemporary games, whether electronic or board games, whose popularity is much higher," says Rodrigo. "With interest, perseverance and discipline, along with a good teacher, I believe that two months are sufficient for a person to be able to play well. But the average person would be four to six months," Rodrigo continues. Ishikawa points out manga and anime as helping to spread shogi in Brazil. "If there was more publicity about the existence of the Brazilian Shogi Association, I believe there would be more players. However, the association is not yet ready to host many Brazilian players. Especially since there are not enough people who can teach shogi in Portuguese. In addition to start the search for teachers, we will develop and concentrate Portuguese content on the internet so that beginners can learn more easily," Rodrigo went on to say. In the visit to the shogi workshop, I had contact with its history and basic rules. It is possible to really realize the presence of Japanese culture throughout the whole procedure of a match. As for the game itself, I'm still within that six months learning curve.